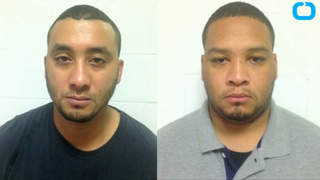 A Louisiana judge has ordered two officers charged in the shooting death of a 6-year-old boy to be held on $1 million bond, a lawyer for the boy's father told the Associated Press. Mark Jeansonne, the attorney for Chris Few—who is still hospitalized after being shot in the head—said that police body-camera video shows that Few had his hands up and was no threat when two officers fired multiple rounds, severely wounding the man and killing his son, Jeremy Mardis. "This was not a threatening situation for the police," Jeansonne told AP. The two marshals, Derrick Stafford, 32, and Norris Greenhouse Jr., 23, have both been charged with second-degree murder and attempted second-degree murder in the case. Few, according to the lawyer, has not yet been told that his son died at the scene. Jeremy was to be buried Monday in Hattiesburg Miss., from where he had recently moved. As the Town Talk reports, Jeremy died around 9:30 p.m. last Tuesday. It is still unclear why Few was being pursued by law enforcement and whether the marshals even had the legal jurisdiction to do so, the site notes. The little boy suffered multiple gunshot wounds to his head and chest after the officers fired at least 18 rounds at the pair. Read more at WKBW and USA Today.